A vibrant variation on the traditional flood myth from the Irular tribe in Southern India. Colorful, authentic-feeling, and vibrant illustrations look similar to traditional Indian folk art and carry the story. Although this accessible story is not religious and stands on its own, it is comparable to flood stories in the Sumerian, Mesopotamian, and Judeo-Christian cultures. A whimsical traditional flood story for comparative-religion shelves. A vivid gouache palette and joyfully painted creatures will delight readers who notice the details…Most striking, perhaps, is Lessac’s rendering of everyone’s eyes—long-lashed and twinkly—which draw the reader’s gaze towards what’s important: all living things. Pattan and his wife are likable characters. The gouache illustrations have a charming naive quality that should have considerable child appeal. ­This title can be read independently or in a group setting and would be an asset to any folktale collection. 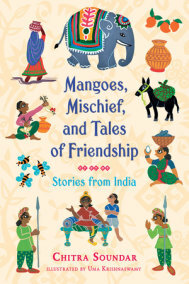 Based on a traditional South Indian tale told by the Irula people, this rendition includes engaging text with emphasis and emotion conveyed through accented and stylized fonts and richly saturated gouache illustrations. While the vibrant full-bleed illustrations make the book a wonderful selection for a readaloud, it also lends itself to being shared in a small group of readers as the aesthetic details of the text may be better noticed and appreciated this way.